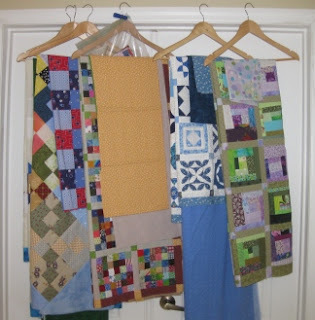 We've got several long car trips coming up in the next few weeks and I thought it would be nice to have a simple handwork project to pass the hours. After sketching a basket pattern on scratch paper, I made a template and used freezer paper to prep a stack of blocks. I tried out back basting and needle turn applique thinking I would do it that way, but it didn't look nearly as nice. I also finished marking the border on my hand quilting project, so maybe I can get that one finished up soon. The last two days were for curriculum planning at school. It was nice to go in and have some time to get everything organized and ready to go. So with Honors Biology taken care of, I can focus in on AP Biology for a while again. I don't think I want to take a whole stack of books and binders to the beach, but maybe I can just e-mail some of the pdfs to myself and work on the I-pad. There is a new number book out by Janet Evanovich as well, so I won't be bored. Just finished the back of Scraptastrophy. 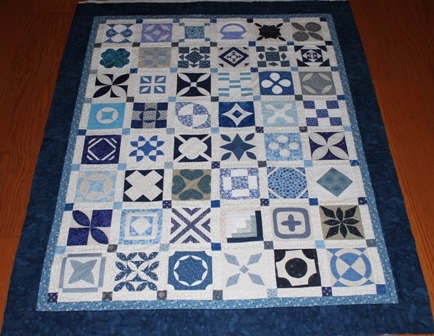 It is a modified courthouse steps arrangement that used up an odd assortment of blue hued fabrics that have been lurking in my stash for quite a while. The fish on the top were from Ryan's baby quilt. He had a fish theme going when he was born -- 10 years ago. The flowers one up from the bottom are from Sydney's baby quilt - 8 years ago. She had a bugs and flowers theme in her nursery. The red white and blue part in the middle was part of a quilt kit that I bought on clearance when a local craft shop was going out of business -6 years ago. Now that I've moved some oldies out I think there is some room for newer fabric in the cupboard. First though, I think I'll go throw this guy on the quilt frame so that people can walk through the family room. I've been doing nine patches as leaders and enders for a while now. I thought I might have enough for a top, but I think I'm probably only halfway there. I was thinking of using the same fabric as alternate squares that I used as the lattice strips in my Postage Stamp Quilt. I think that I have enough, which is nice, because I always seem to run out of background fabric faster than anything else. Scraptastrophy was last in the stack of finished tops awaiting Bs. I went with random blues to keep the completely random scrap theme going. I have even more random blues ready to piece together for the back. Maybe a large random log cabin effect? We shall see. I'll visit the orphan binding drawer and this one will be ready for the frame. Perhaps another double loop variation with a floral kind of motif? The kids were grumpy about going to swim team this morning but it got us all up and out, which can be good in the summer. This afternoon Anna had a visit to the orthodontist. 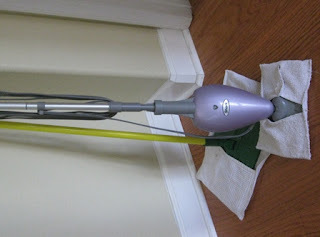 In between quilting and kids I got caught up on laundry and did some general cleaning type stuff. Tomorrow looks about the same and then Wednesday and Thursday I'm in to work half a day. We are coordinating curriculum as a department and aligning the new textbooks to the new standards and end of course exam. Should be fun. Just pulled Starlight off the frame! I'm glad I went with the swirlies instead of the stars. I think I'll go get the binding put on so I have an excuse to sit and watch TV after the kids go to bed. I have a couple of things recorded from last week while I was gone. 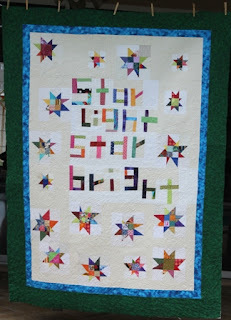 I tried out some stars and swirls in the border, but they looked too pointy I think. Instead I am trying out these swirly shapes which are so fun and relaxing to sew. Kurt has taken all three kids to the beach for surfing and I am still hanging out in my PJs enjoying some quiet time. I am going to be so totally spoiled by the time school starts again. Until then, I'm loving life. I got home last night after a LONG wet ride across the state of Florida. We've been in a bit of a drought, so it is nice to have the rain, but it made for slow going on the road. The rain followed me home, which made it a great day to take the kids to see a movie. It was a great week at the AP Bio workshop, I'm full of lots of new ideas that just need to be processed and implemented. 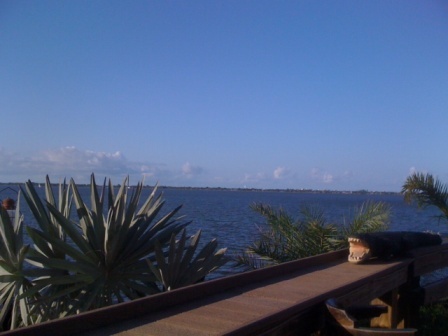 It was nice to get away for a few days, but it is always so good to get back home again. 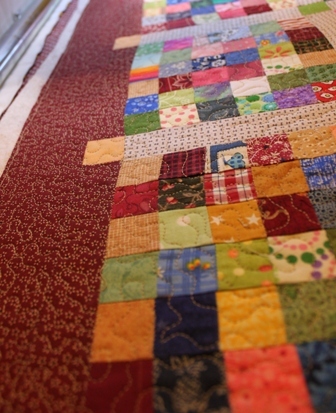 I took the Elm Creek Quilt along for hand quilting and it is getting SO CLOSE to being done. I am on the last block, so all that remains are the borders. With several long car trips on the schedule, I think it will be finished soon enough. 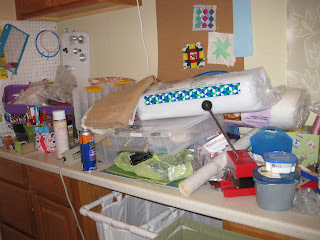 I am pondering a basket applique project as my next carry along, I know I saw a cute one on somebodies blog recently. 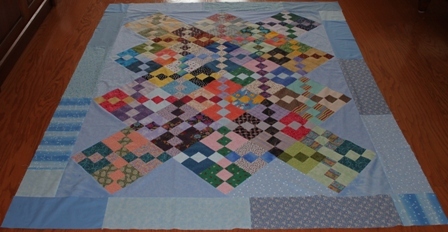 This afternoon I pulled out the next quilt on the list in need of borders, backing and binding. Starlight is now ready for the frame. I think I'll do free hand stars on this for obvious reasons. 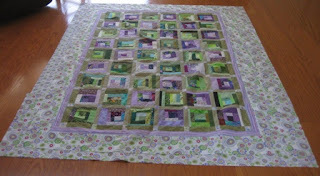 I was thinking about white thread, but that would stand out a lot on that green border, maybe lime green? Sydney has two friends over for a sleepover, though there isn't any sleeping yet. Maybe they will all sleep in tomorrow? Well, maybe not. LAST yellow Saturday. I know lots of you will be happy to see the yellow month end. I know I am looking forward to next months colors. There are still 5 more days in the month though, so feel free to finish up yellow at your leisure. I'm out of town this week for and AP class but I wanted to put up some pictures of Anna backstage at Joseph. (Mainly for my mom, who loves it when I post photos of the kids.) Photography was strictly prohibited during the performance. Instead the kids choir organizer arranged for all the willing actors to line up backstage assembly line style and pose with the kids before the show started today. Here is Joseph, also known as Anthony Federov, most famous for finishing fourth in American Idol. Anna thought it was strange that Joseph was a blond, we watched the movie version with Donny Osmond and it colored her expectations. She said everybody was very nice. Especially all the wives who were "20 ish" They liked to hang out with the kids. There was one wife who was "30 ish" and she wasn't mean, but she was very serious and was concentrating very hard. Anna is sure it has something to do with being older. So Kurt took her over to Girl Scout camp straight from the performance this afternoon. In some ways it is bad timing because I'm sure she is going to be VERY tired, but if the timing had worked out differently she might not have been able to do the play at all. 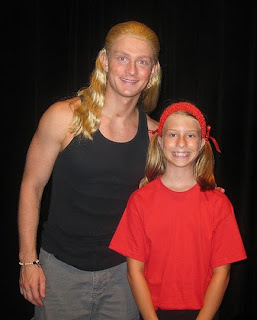 Sydney will be going to rock climbing camp and Ryan chose Mr. Science. I'm 7 hours away in a hotel room so lucky Kurt gets to handle everything for the week. Wish him the best of luck. Last night while chatting with the in-laws I was able to finish the stitching on the binding of Lilac Potpourri. I'm so happy with the border and quilting and the way it evolved itself as it went along. The only initial plan was to use some scraps from the green and purple jars. 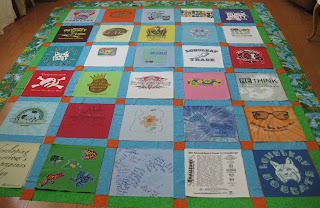 Speaking of evolution from a need to use scraps --the postage stamps are quilted and trimmed. All that remains is attaching the binding which has already been cut. 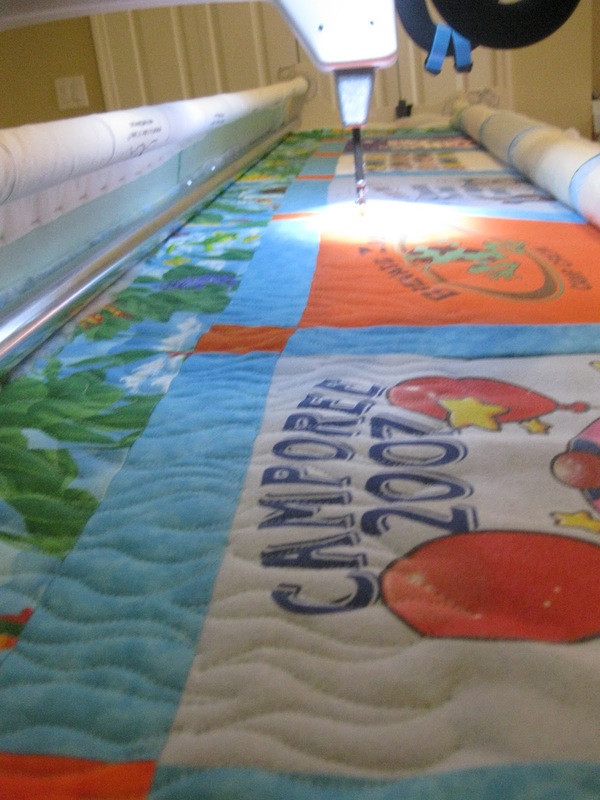 I started with a brand new 1,200 yard spool of thread at the beginning and still needed more. I think I'll put some stats on the label for this one. I haven't added it all up yet, but there have to be about 4,000 pieces in this one. Kurt and his parents have taken the younger kids to a swim meet while Anna stayed behind to rest. 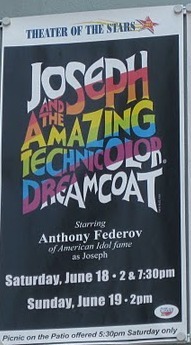 Actual performances start for Joseph today and the rehearsal yesterday was scheduled for 12 hours. We are encouraging her to have as much quiet time as possible in between. She says the actor playing Joseph was on American Idol the same season as Carrie Underwood. He didn't win, but Anna thinks he is still a very good singer anyway. We are all going to the evening performance tonight. I used an entire bobbin on the first row of quilting. I think this one is going to take a while. Each square finishes at one inch and every square has to have quilting in it. We have company coming this weekend and I'm out of town next week so this one may not be done for a bit. Since Postage Stamps was all ready to go I thought it made sense to get it loaded onto the frame. 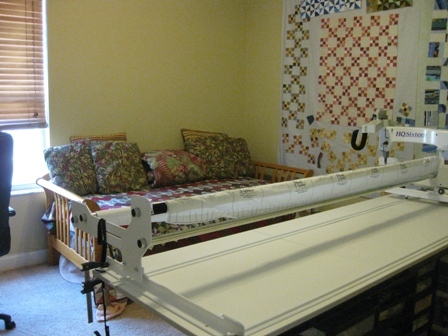 After that it was hard to resist getting a few rows of quilting going. I am using a khaki colored thread on this one and a very small meander. Almost a stipple really. With the one inch squares of fabric showing on top, something very small seemed to fit well. Most of today was a textbook workshop. The most useful part (of course) was chatting with the other teachers. I got fully caught up on district gossip and found out about all the open positions and who filled which open jobs already (including my old job). We talked curriculum too of course, they are redoing the AP Biology course next year and so everyone is working slowly toward the new standards. The kids LOVED the sitter that we had today and Sydney was very sad that we had to take her home. Anna had a blast at her rehearsal and feels very grown up pretending to be a professional actor for a few days. Kurt is worried that Ryan is going to be bored so we went out to Hobby Lobby after dinner so he could pick out a model airplane to work on. Lilac Potpourri is done. All that remains is the stitch the binding. Not sure if I will do that by hand or try machine stitching. The purple and green blocks are mile a minute blocks from the Rainbow scrap challenge. March was green and April was purple I believe. Still continuing to do my usual summer organization and clean up. This was the laundry room a couple of days ago. 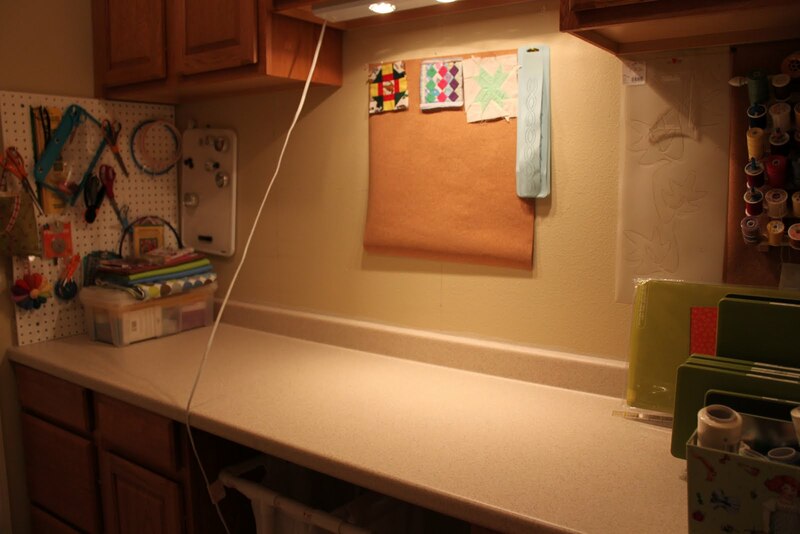 It took a beating when I cleaned up the study as most of my sewing stuff lives in here when it isn't being used. The idea is that the study can be a guest bedroom when we have company. Everything has found its way back to wherever it is supposed to be and is ready for the next project to come along and mess it all up again. I forgot I had a new die for the GO that hasn't even been opened. I'm going to have to give that a try. The next two days are training days for school. We are getting new books next year and they are going to show us all the special features and bells and whistles. 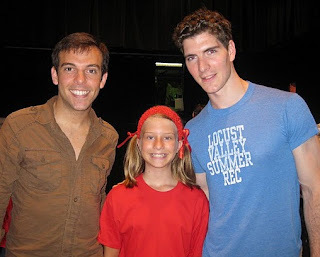 Anna is also going to start her rehearsals for Joseph and the Amazing Technicolor Dreamcoat. She is pretty excited. Lilac Potpourri is loaded on the frame and the first little bit of quilting is started. I did a pattern earlier in a double bubble kind of thing, this is a variation of that with a pointy outer bubble to look like leaves. It is kind of hard to see with the lime green thread, it really blends in well. 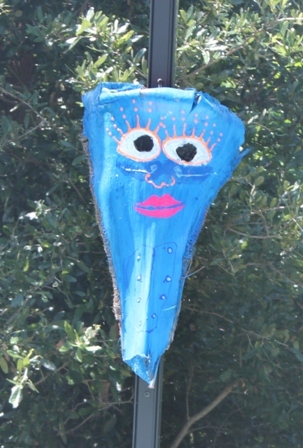 Kurt hung up the tiki masks that the girls painted at surf and art camp. I think they look really nice next to the pool. I tried to talk Ryan into making one as well. Kurt even saved a palm stem when he trimmed the trees this weekend. Ryan doesn't want to though, so it is just the two masks for now. I don't want to fold the postage stamps up and let it get wrinkled so that it needs to be ironed again. Instead it is just going to hang out on the floor of the formal living room until Lilac Potpourri is ready to come off of the frame. I am really lucky that Kurt isn't the kind of husband that comments when he comes home and trips over a quilt on the floor. I know some ladies who rush home to get everything tidied up before their husbands get home for the day. Hard to imagine living like that. I will make sure it all gets picked up before company comes this weekend. Seems reasonable enough to me. Still working on my little marathon of binding backings and borders. I got some more maroon for the border today and then cut out the binding and pieced a back for the postage stamps. 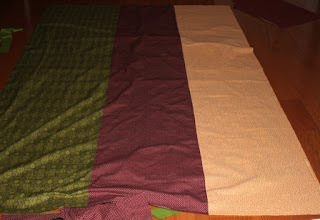 I played with several different layouts, but finally decided on simple vertical stripes. I'm starting to run out of long lengths of fabric that can be used in backs. I'm fairly chuffed at having gotten three quilts ready to quilt this weekend. 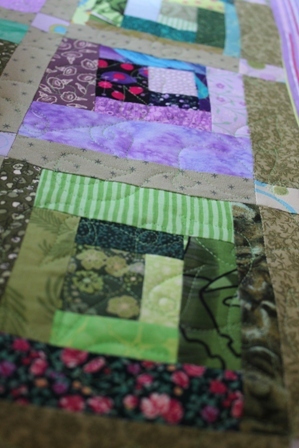 Hopefully I'll have some time to do the actual quilting during the week. I've got training on our new science textbooks for two days and Anna is starting rehearsals for Joseph. Kurt's parents will be in town next weekend for that. Still, there should be time in between to get some things done. I was up into the wee hours last night working on the postage stamps. It was "done" a while ago, then I decided that it needed to be bigger. Having used up all of my 1.5 inch strips, it got put on the back burner for a while. Somehow the scrap drawers keep getting full again. 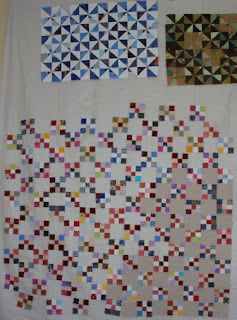 So I pieced the last 4 blocks last night and then cut sashing strips and cornerstones to add two more rows. 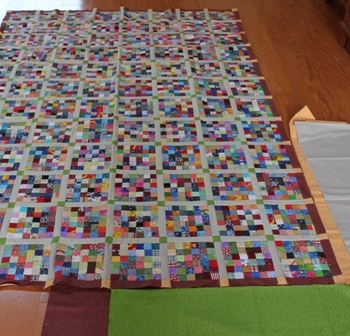 It is all sewn together now and just waits for borders. Kurt likes the maroon from the outer sashing strips which is, of course, the only fabric that I don't have much of. It is going to sit here until a decision is made. I am on a roll and refuse to get stuck on the borders again this time. I was on a roll with the B's and so pulled out the next quilt in the row. Dear Jane needed borders, backing, batting and basting. I went ahead and cut the binding while I was at it. This one is supposed to be hand quilted, so it might be a while before I get to it, but it is ready to go. 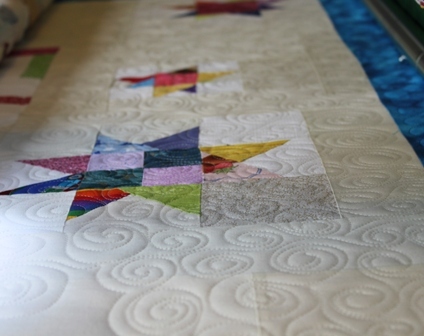 Spray basting works really well on smaller quilts. It is a nice size to have on our next long car trip. Carrying big quilts around can be cumbersome. It's only 9, I wonder how far I can get on the postage stamps? Whilst cleaning the study I collected and organized all of the quilts in progress that are to the flimsy stage. most of them are waiting for borders. 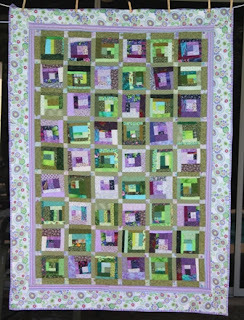 After sorting them into order of priority, I decided to get started on the purple and green quilt which is going to be called Lilac Potpourri. Lizzie was right there to help of course. I can't quilt without some sort of company or help. Borders were up first. An inner striped section first and a wider patterned border after that. The backing used most of the extra fabric, and a bit of green from the stash to help stretch it out. Even the binding is ready to go -- more of the stripe to go with the inner border. I think I'll go ahead and load it on the frame, and then chip away at the next on the list. Sydney came back from her slumber party all tired and out of sorts, Ryan and Anna are playing at friends. Kurt is doing projects around the house -- so nice to have a quiet Saturday at home. I hope everyone is having a fabulous summer. I know those of us that are teachers are enjoying every minute. 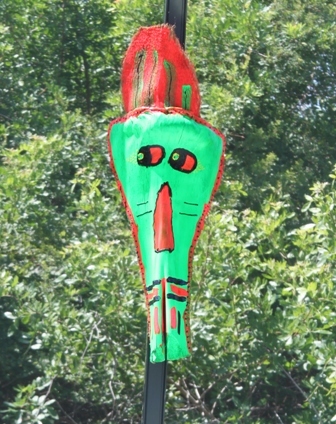 Use the widget below to post a link to your scrappy creations. As for me, I'm working on some yellow pineapple blocks. Trying hard to use up all the little triangles that are leftover from joining binding. It is about all that is left in my scrap jar right now. I got the quilting done on Meredith's T-Shirt quilt and trimmed it up in time to get a quick photo before the sun when down. I've just got the binding sewn on and am pinning it to finish it off. I'm trying the binding by machine this time, to sew it by hand would probably double the hours spent on the rest of the quilt. I've got a list of the time spent, so I'll add it up as soon as it is done done. I've been powering through this one and trying not to get caught up on any of my usual stumbling steps. As I cleared out the study today I found A LOT of quilts patiently waiting for borders or backing. Thankfully by the time binding comes around I can see the end in sight and usually make it through. Does anyone else get bogged down by the Bs? The girls came home from camp today with all of their artwork for the week. I usually take a photo of them with their creations to preserve them for posterity. They were off to play as soon as they got home again though, so I'll have to try again tomorrow. Sydney is at a slumber party and the other two have been fast asleep for a while now. I think Kurt will follow soon enough, he isn't quite recovered from his red eye yet. I so enjoy the evenings when everything is quiet and peaceful. I had been putting off the decision making on the t-shirt quilt because I knew that I needed to clear out the sewing room and empty off the longarm table before I could start. 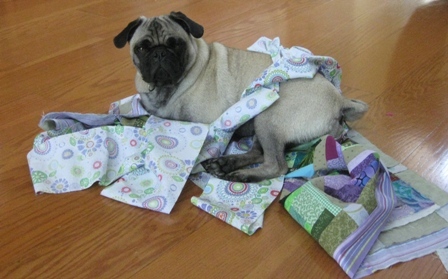 I also needed to decide on a quilting pattern and find a free day. 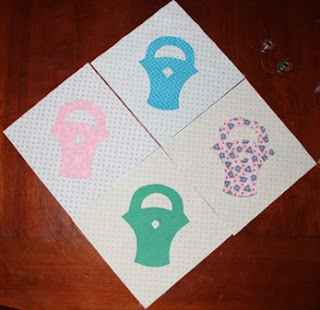 So I sketched out a couple of quick ideas for quilting on index cards and handed them to Meredith when she came along on morning car pool pick up. She glanced at them ever so quickly and picked one almost immediately. 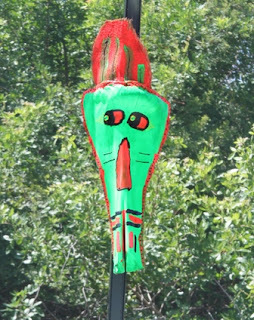 No hesitation or pondering, just pointed to a flame looking design and said "that one". So, with that decision made, I jumped in and started the process of clearing, cleaning and putting away. I promise that it doesn't usually look this scary. A lot of things got dropped in place when I switched jobs in the middle of the year, and it was easier to just pile things and shut the door than to deal with them. By lunch time the sewing room was tidy and the machine was clear and ready to sew. I chose a very light teal thread which is blending in with most of the t-shirts beautiful. 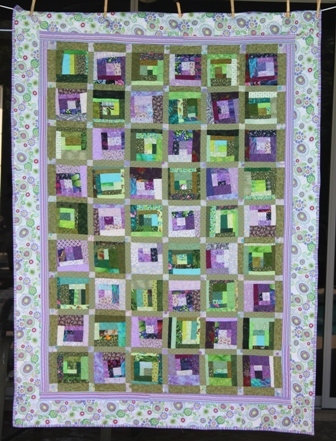 The pattern is a free motion flame pattern that is worked in intertwining rows. It is going fairly quickly and the first row of t-shirts are already finished. I guess that equates to about 22 linear inches with the borders and sashings, so I will definitely finish before dinner time. The girls are on their way home now and Ryan wants to swim when they get here. He has missed having them to hang out with this week. 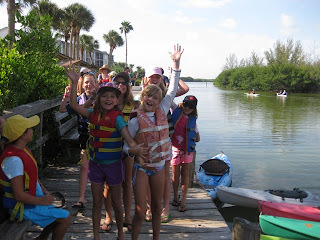 The girls have been at Surf and Art camp this week. Today was a family Kayaking trip. Kurt got home from San Diego on the red eye at 7 this morning and was ready to head out again by 8:30. He is a bit tired right now. 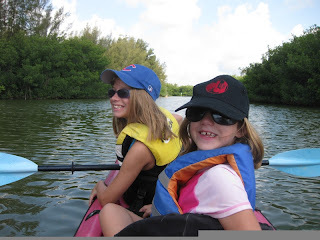 The girls shared a kayak with Kurt while I had Ryan. We toured the Banana River which is part of the Indian River Lagoon, our local estuary where we saw a great assortment of the 4,300 species represented in our local waterways. 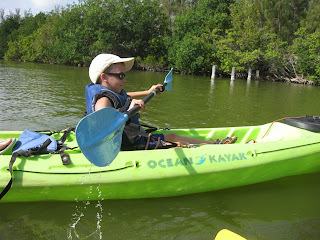 From all 3 types of mangroves and two types of herons to horseshoe crabs and stingrays. The manatees were the highlight of the day. A huge mating group frolicked at the end of an outlet while a mom hung out with her new baby along the waters edge. I'm not sure if you can see it, but the gray bump near the shore is the back of the mom. 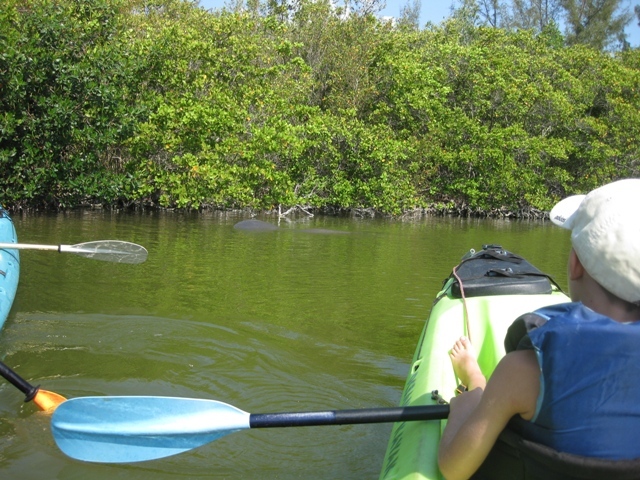 As we were heading out from our Manatee encounter, we spotted a dolphin bobbing up and down between the docks. The kids really enjoyed the trip and came home sunburned and worn out. 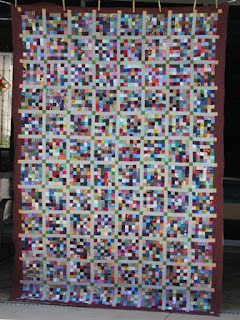 My neighbor and friend Sheila made a quilt while staying with her new grand baby. She didn't have any quilting supplies but needed a project and so made a template from a cereal box and begged some scraps from a relative. 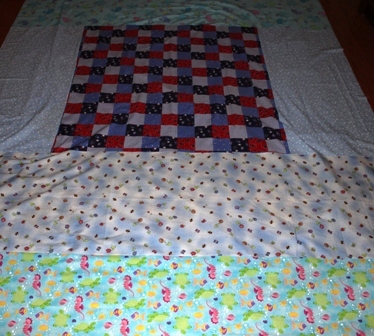 She brought the top back with a flannel blanket of some sentimental value and asked me if I could quilt it for her. As payment for my services she offered to make supper. She brought over a fabulous meal with pulled pork, french bread, baked potatoes and green salad. The kids were all very impressed and wanted to make sure that I got the recipe. 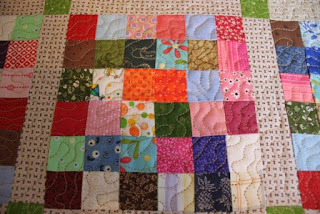 The quilt didn't take long to quilt up and all I've got to do now is hand stitch the binding. The girls had another great day at surf and art camp. Dinner conversation was filled with terms like "caught a really good wave" and "needed more wax for my board". I think there will be some surf board shopping in our future. After swim team Ryan came in to school with me to finish off the odds and ends. They had been in to wax the floor yesterday and it all seems so much more pleasant than it did before. I've still got decorative fabric touches to add, but I'm waiting for another Joann coupon to get the supplies for bulletin boards and such. The only thing I have to do tomorrow is afternoon carpool so Ryan and I are planning on a jammie day. I can't think of many things better than summer vacation. Sydney went to surf camp today without her lunch. My good friend Meisje who drove this morning was kind enough to get something for her to eat at a gas station, but Sydney was determined not to forget tomorrow. 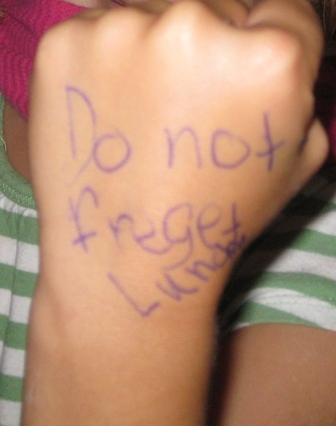 She hopped up in the middle of dinner to write a reminder on her hand. 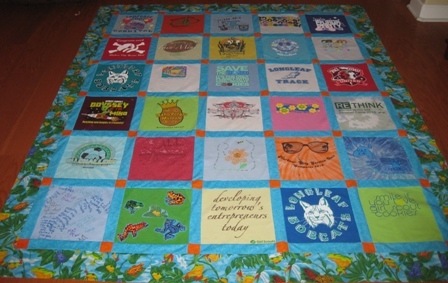 I just finished putting the border on Meredith's t-shirt quilt! 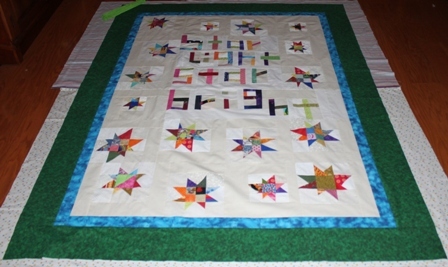 I have at least three quilts that have been sitting for months waiting for borders, but the knowledge that someone is waiting for this one specifically was enough motivation to get me through the border stage. I think it is just a smidge too big for the backing fabric that came with the shirts, I'll have to see if I have anything to stretch it out just a bit. 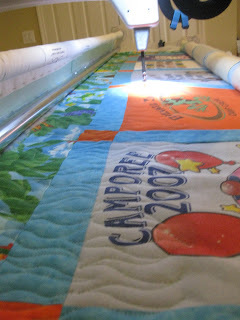 Unlike Amy who was whipping out quilt tops before breakfast, some of us take a bit more time to come up with a flimsy. First up this morning I got the girls off to surf camp, after that it was down to get Ryan from swim team. 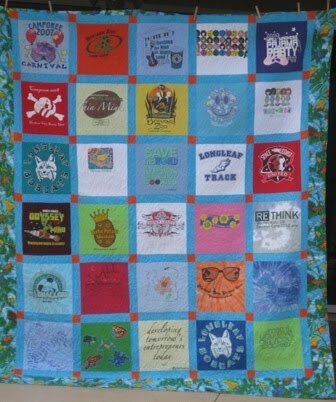 Ashyln had one more shirt to add to the quilt, in place of one of the backs. Then Ryan and I headed out for exciting errands. We needed to drop forms off at the doctors office and pick up a "rash guard" for Anna to wear at surf camp. I must admit that when I saw rash guard on the list I thought it was some sort of lotion. I guess I'm pretty illiterate about surfing for someone who lives in Florida. After lunch I ran out to the bookstore to pick up summer workbooks for the kids that had been special ordered. 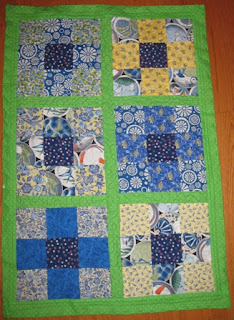 So FINALLY, by 1:30 I was ready to settle down and start sewing the blocks together. It is just 6 now and the borders will be ready to go on right after dinner. Not quite the speed of light, but not bad for a 30 block quilt with sashings and cornerstones. Ignore the fact that the quilt is upside down. Blogger is being difficult and dinner beckons. I've been sorting through the scrap jars cutting strips and squares. 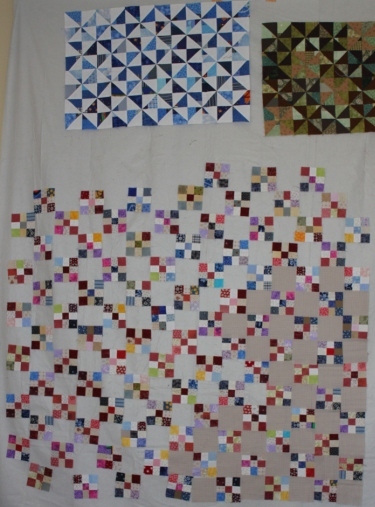 Most of what is left is strips less than 1.5 inches and triangles from joining binding. I'm thinking that another pineapple quilt may be in order. 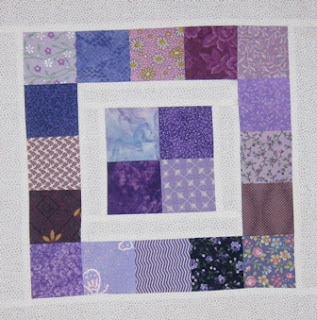 During the process I found enough purple squares to finish off a purple scrap block to go with the rest. 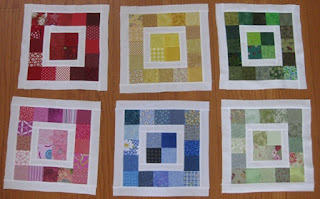 I've got some little stacks started with other colors, but none has gotten 20 squares tall quite yet. I really liked the frog fabric that came with the t-shirts for Meredith's t-shirt quilt, but I wasn't sure that it went with the other fabric. I felt that something "solidish" was needed to tie the colors together. So, it seemed that a trip to the fabric shop was needed. There is a new exit onto the highway now, so I was driving right past Waffle House and popped in for a quick breakfast. Kurt took the kids to see a movie so it was a nice quiet morning at home. 2.5 hours later (I've been keeping track), I had the sashing cut and the last few shirts added in. I'll let it settle for a bit and get some feedback from the eventual owner to see if she approves of the changes. 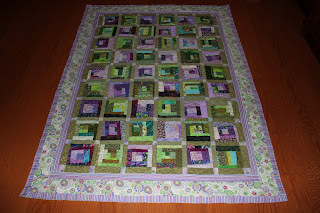 While pulling some yellow squares for some rainbow scrap blocks, I decided to play catch up and fill in some of the past months when I was too busy to sew much. I've been struggling to find a nice shade of yellow for my blog this month. I guess that says a lot about how I feel about yellow. I've got some squares and strips pulled to start a few blocks that will go in with other monochromatic blocks. I'm having a hard time visualizing an entire yellow quilt. Maybe a place mat? 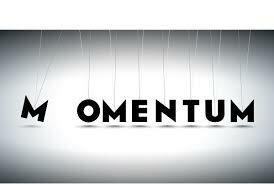 We will have to see what the month will bring. 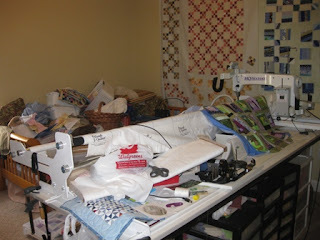 I'm just back from a morning run and as soon as I have had a chance to shower, it will be off to the sewing room for me! I hope everyone else is finding something yellow in their scraps stash or stack of UFOs. Went for a celebratory birthday dinner with my good friend Meisje. Kurt stayed home with Anna and the stomach flu. He is a good man. I was chatting with a friend this morning at swim team. She asked if Ryan was feeling better and I commented that we had been lucky enough to escape without anyone else having caught it. That was Anna's cue of course to get sick on the way home. So I got to spend the rest of the afternoon sanitizing my car. After that though, I spent a couple of hours working on the t-shirt quilt. 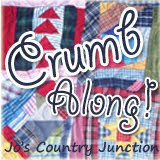 I just need to verify the layout and begin working on sashings and cornerstones. 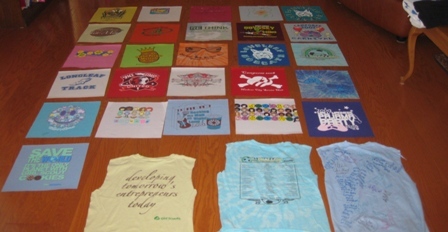 There are 27 shirts, which is a strange number, but I haven't included any backs. There are four backs that had designs, so it could work out to a nice 5 by 6 layout if those all go in. Alternatively I could do a 4 by 7 layout with only one back. Tonight I am escaping from the house of germs to go out with a girlfriend for drinks and dinner. Kurt has the day off tomorrow and I'd like to spend some time sorting out my classroom. Then there is a birthday party in the evening. Other than that I think it is a fairly peaceful weekend. Does anyone else have a spouse incapable of telling "good" towels from garage towels and rags? I celebrated my 17th anniversary a few days ago and still can't get my husband to understand the difference between the two. I get a little peeved when he takes one of a matched set to dry the car, but nothing compares to the surprise of finding yourself drying off with something that was sopping up spilled paint last week. I understand that there is a certain area of gray, and the cycle of rotation can lead to ambiguity, but it just isn't something I have managed to communicate in all of our long years together. Faced a stack of t-shirt backs that I was incapable of tossing out and a stack of old towels I was trying to keep out of the linen cupboard, I took out my rotary cutter and started cutting them into nicely sized squares. While working on those, I was inspired to make some new covers for the floor duster and steam mop. They each came with a single cover, but it never seems to be clean when you need it, so now I've got a whole stack of extras. 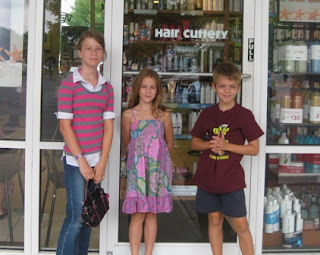 Because it was just that sort of day, I took the kids out for haircuts. Although I got a "before" picture, they all scattered again before I could do the "afters". Then we went for lunch and made a trek to Wal-mart for birthday presents needed for upcoming parties. I tried to sneak a quick stop into Hobby Lobby in there, but the girls all came up with a list of things they "needed" so I put that off until tomorrow. 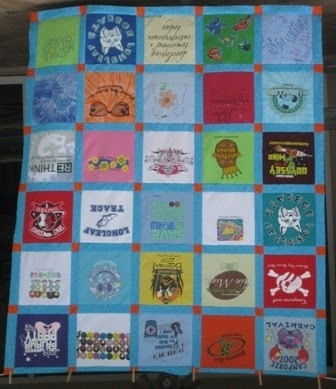 I have a coupon so that I can get some more interfacing and make some progress on the t-shirt quilt.